India ranks among the world’s top employers in the informal sector, according to the International Labour Organisation. It puts to work about 400 million people — more than the entire U.S. population. In India, it’s nearly impossible to avoid. Retail stores offer discounts for customers if they pash cash, and landlords often take a portion of the monthly rent in stacks of 1,000-rupee notes. Back-alley hawalas transfer billions of dollars around the globe with no questions asked, and thousands of unregistered and underpaid chauffeurs and housemaids don’t file annual income declarations. “The black economy is growing faster than the white economy and everybody is involved — the entire country," said Arun Kumar, author of “The Black Economy in India," who came up with the $780 billion estimate by looking at wages, under-the-table transactions and cash-based real estate sales. “This isn’t just a problem among the wealthy — almost everyone with disposable income participates in the black economy and it’s accepted." Total corporate and personal income tax payers in India amount to about 40 million — roughly 3 percent of the country’s 1.2 billion people. To expand that, a Finance Ministry-created panel suggested putting levies on farmers in the untaxed rural sector who make more than 5 million rupees ($76,000) per year — an approach backed by the IMF. “We think there’s scope to bring the fiscal deficit down in particular with the revenue side," said Thomas Richardson, the resident representative of the IMF in India. “It’s really a task of widening the tax net — not raising rates, but bringing more people into the tax net." 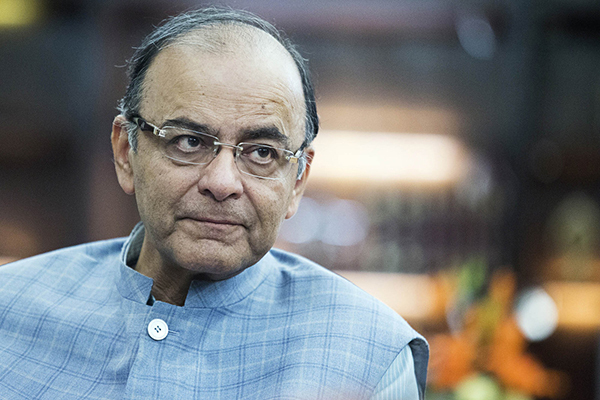 “We need to strengthen the neo-middle class and put more money in their pockets," Jaitley said. “So bringing tax violators into the tax net, yes, but bringing people with marginal incomes into the tax net — I’m not so excited about it at all." While Jaitley this year is again struggling to raise revenue, he’s confident he’ll hit his deficit target of 3.9 percent of GDP without slashing funds for roads, bridges and ports. Shortfalls in direct taxes and state assets sales will be compensated by higher-than-expected indirect taxes — including payments on services and exports.